Unless if you live in Quebec or drank Unibroue beer regularly back in the 1990s, you likely have never tried this beer before. La Gaillarde is a Belgian style pale ale that was a staple of Unibroue's lineup until the end of the 1990s, then, like Eau Bénite, made a temporary return as part of a collection. Other than my friend Dallas, I may be the biggest Unibroue fan from Manitoba, I love everything that Unibroue brings out, aside from Éphémère Pomme. So when I got the chance to try a brand new (old) Unibroue beer, you can bet I was as excited as a child on Christmas morning! Appearance: La Gaillarde pours a hazy banana-orange colour, very hazy and similar to a Blonde or Blanche de Chambly. Very snow white head, there's a bit but it slowly dies down. Thankfully this isn't a beer that foams over like Unibroue's beer around last Christmas. Looks like a nice patio beer to me. Aroma: Honestly, this seems like a Blonde de Chambly to me. It has a slightly sweet, slightly citrusy aroma with a bit of lemon, coriander, wheat and bubble gum. It's an inviting aroma. Taste: As I said before, Blonde de Chambly. It's slightly sweet, but not much going on there. It's actually quite carbonated on the tongue, I can feel lots of bubbling action on the palate. It has a bit of a lemony citrus, a bit wheaty and of course, Unibroue's famous yeast. As for aftertaste, I notice a bit of bitterness that lingers around, as well as a bit of lemon. Overall Thoughts: For a Unibroue beer, La Gaillarde is not their best beer, but that said, looking at the thermometer right now, it is currently 32C outside so this beer is helping take the edge off the heat. The beer has 5.0% ABV so you can't expect a beer to smash you in flavour. It's a lightly citrused Belgian Pale Ale, with a bit of carbonation, wheaty, and I could swear it's actually a Blonde de Chambly. This is something I would drink regularly if it came to Manitoba* because this is a great beer to drink outside in 32C weather! This isn't something that will scare off finicky drinkers so if your friends like a Rickard's White, they will surely enjoy this bière Québécoise! Another thing, Unibroue seems to be doing a slight re-branding of their products, the Unibroue logo on the metal top of their corks has a slightly different logo than before. As well, as you can see in this photo, the cap on this beer is no longer the silver cap with the piece of wheat, but instead, the Unibroue logo. I very much remember the silver cap with the wheat symbol since my first tasting of Unibroue in 2004, kind of sad to see it go (especially as a farm boy), but it happens! *La Gaillarde is coming to Manitoba in June 2012 as part of the Unibroue Summer Collection, which also includes La Fin du Monde, Blanche & Blonde de Chambly. Will be available in 12-packs and retail for around $25 including tax. On the label: La Gaillarde est une bière sur lie, refermentée en bouteille, issue d'un heureux mélange de céréales et d'aromates. Elle est brassée dans le plus grand respect d'une recette médiévale comme savaient le faire ces femmes gaillardes du Moyan Âge. La Gaillarde est une bière blonde douce, legèrement épicée possédant un nez malté. 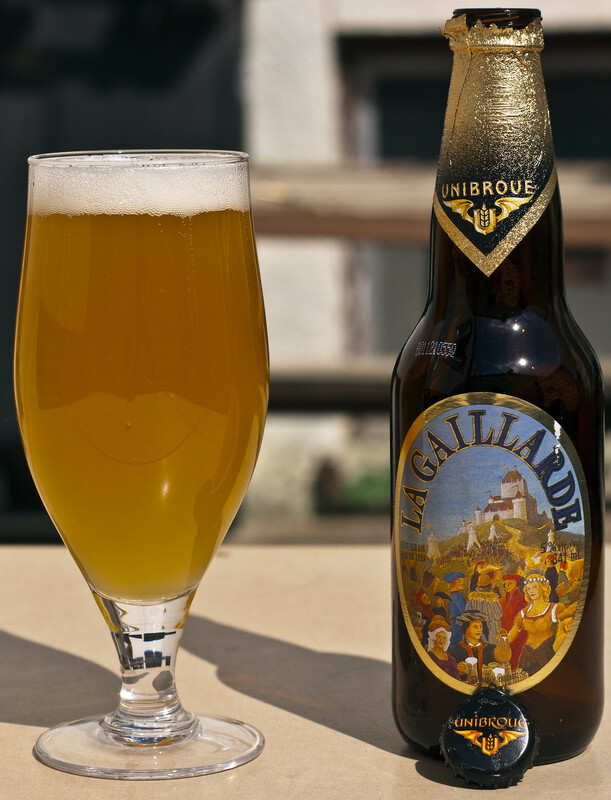 La Gaillarde is a beer on lees, bottle fermented, resulting from the happy marriage of cereals and aromatics. It is brewed according to an ancient medieval recipe dveloped by the hardy women of the Middle Ages. Gaillarde is a mild and slightly spicy golden ale with a malty nose. Looks like the perfect sipping beer while manning the BBQ! Exactly! Just like Blonde de Chambly, goes really well while manning the grill! Is that beer available in Manitoba? Haven't seen it at my local liquor mart yet. Nope, not available in Manitoba. Only available in Quebec in a case similar to the Unibroue Collection Unibroue releases in Manitoba right before Christmas. It's always possible it could be part of this year's Christmas package though. @Rob: It is now coming to Manitoba, sometime in mid-late June most likely as part of the Unibroue Summer Collection.